A reliable plumber offers not only timely service, but also has the ability to take care of every plumbing need. When disaster strikes, you need services that work . . . and you need them fast! 4 Star Plumbing Services is devoted to giving you complete plumbing services, including drain cleaning and faucet replacement. Our experience with water heaters and plumbing fixtures in Fort Lauderdale makes us an authority for all your residential plumbing needs. We also provide free consultations, so you have nothing to lose and only a fully-functional system to gain. Drain Cleaning –Clogged drain and sewer cleaning solutions including pressure jetting and video Inspection. Faucets – We offer installation of shower or lavatory valves, bathroom tubs, and kitchen faucets. Fixtures – From small repairs of garbage disposals, sinks to toilets, showers and bathroom tubs. Gas – Gas appliance repairs and replacements. Insurance Claims – We work with your insurance to provide you with restoration solutions for any kind of plumbing damage. Pipe Leaks – We can locate and repairs through video inspection and provide smoke testing as well as options for pipe repairs or replacement. Pool Heaters – Repairs and installation of all types of pool heaters. Remodeling – Complete Kitchen and Bathroom renovation. Water Conservation – We’ll provide you with ideas and solutions to reduce water consumption such as low consumption Toilets, shower heads and faucet replacements. Water Filtration –Different models of water filters and whole house water filters available. 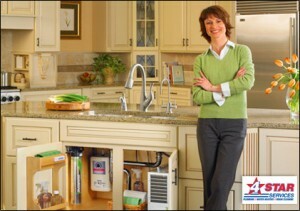 Water Heaters – Repair and installation of tankless and other water heater systems. Contact us if you have slow or clogged drains! Whether it’s repairing broken drains and sewers or offering rooter services, 4 Star Plumbing Services has you covered. We use drain cameras to locate cracked pipes, broken sewer lines, and root infiltration. Additionally, our high-pressure water jetting technology removes scale, grease, and debris build-up, making your system clean as a whistle! 4 Star Plumbing Services will upgrade any of your fixtures to more economical options. If you want to “Go Green” or cut down your water bill, we have the appliances you need. For the best long-term results, our products save you money and reduce energy expenditures. Now you have even more incentive to contact 4 Star Plumbing Services for a free, no-obligation consultation! Call us today. If you are looking for Fort Lauderdale plumber services then please call or complete our online request form.